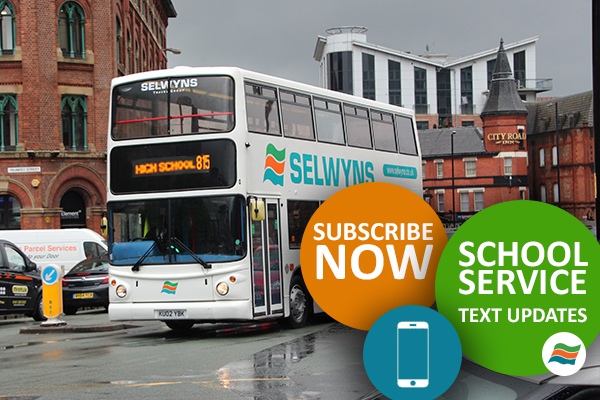 As a major service provider to the Transport for Greater Manchester (TfGM), Selwyns provide school bus services for home to school travel, resulting in a safe, reliable transport solution. We have one of the largest fleets of school buses in the North West and in particular in the Greater Manchester area. Below are the services we are operating as part of our TfGM school services from September 2018. Bus running late? Stay informed. Opt into our text message service! Our text message service will inform you of an estimated arrival time if your bus is running 10 or more minutes late. If you’d like to opt in, please email your mobile phone number to busservices@selwyns.co.uk.